THOMAS BYRON NORTHUP (Nathan 11, George 10, John 9, Benjamin 8, David 7, David 6, Stephen 5, Henry 4, Thomas 3, Thomas 2, Thomas 1). Born 27 May 1852 in Ohio, the son of Nathan Northup and Harriet Sherlock . Died 31 July 1901 at Wauneta, NE. Wife:	ELIZABETH CATHERINE FANNING, b. 28 September 1858 in Illinois; died in Fredonia, KS; married 25 December 1876. She was the daughter of Andrew Fanning. Estella Grace, b. 10 Sept. 1882, Vista, NE. Married ____Taylor. Virgil, b. 16 Oct. 1883. Earl Edwin, b. 19 January 1886, Audubon, Iowa. Jessie, b. 18 Feb. 1889, Beatrice, NE. Married Joseph Fisher, d. 1964. Floyd, b. 02 March 1892, Russelville, AR. Walter Henry, b. 25 July 1897, Coyville, KS. The following is an obituary that was found in an old newspaper article. T. B. Northup, brother of Mrs. J. W. Oxer*, and well known to many of our citizens, was killed by a bolt of electricity at the home of a relative seven miles from Wauneta last Friday evening. A message to that effect was received Saturday morning and Sunday evening Mr. Oxer joined H. H. Northup of Lincoln on the train going west. They arrived at Wauneta Monday where they learned that the remains had been buried Sunday at Imperial beside the decease’s mother-in-law. Mr. Oxer and Mr. Northup drive out to the relative’s home where the deceased had been stopping and learned that he was seated near the stove when the bolt struck the stovepipe. He put his hands to his head with the exclamation of “Oh!” He immediately rose to his feet and fell dead. It is not believed that he was struck by the bolt but rather that he died from the shock. Mr. Northup was forty-nine years of age and leaves a wife and seven children, some of whom are grown, who reside at Coyville, Kansas. He was well educated and a man of most liberal views. The greater portion of his active life was spent in the school room, but of late years he has been unable to stand physical exertion owing to weak lungs, but his health was greatly benefited by coming to Franklin and still more at Wauneta. His sudden death by the elements is certainly a very sad ending to an already sad chapter. Mrs. Oxer has the sympathy of her many friends in this community. 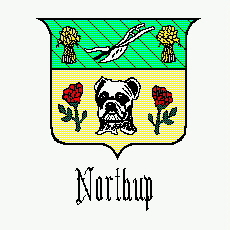 *Thomas' sister’s name was Martha (Northup) Oxer. Thomas Byron Northup's page is under construction. Please check back often for updates.